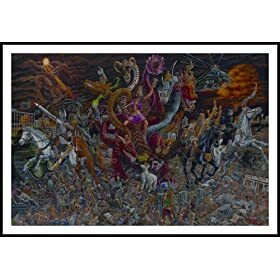 Tom Masse (Apocalypse) Black Wood-Mounted Art Poster Print - 22" X 32"
My money is on c). I wish the picture was bigger on Amazon so I could see all the details. I guess that means I should be buying the poster. But, from what I can see, it appears that Tiamat and the Four Horseman are hanging out on top of piles of corpses. They are probably talking about The Office or 30 Rock. I mean, this is probably their equivalent of the water cooler, right? Also, it looks like maybe there is a 5th horseman who is flying a chopper? Or, perhaps that is Chopper Dave, from Sealab? In any case. I love it!